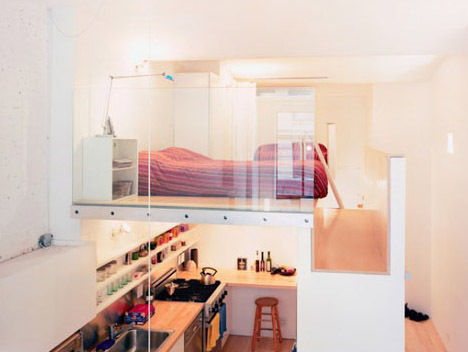 The thought of loft-style sleeping may bring back childhood memories of kids’ bunk beds … but for urbanites in small not-quite-double-height apartments like this one in New York City, clever space-saving furniture designs like this one can also help make the most out of tiny-interior dwellings with low square-footage, narrow layouts and limited access to natural light. 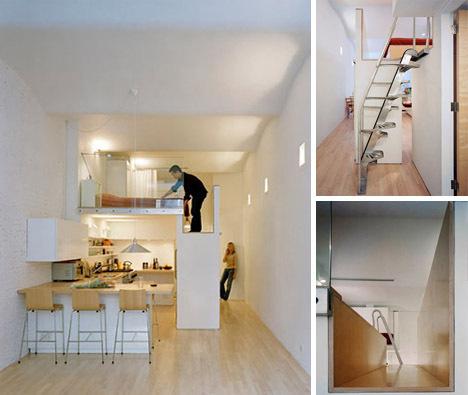 A few simple white wall and ceiling/floor planes added by KSWA help divide spaces within this (essentially one-room) redesigned residence, creating an entrance passage – while providing enclosure from above and the side for part of the kitchen and a desk workspace below. The resulting small hall has a side ladder leading up to the bedroom. Also, by thickening the vertical-wall zone a hallway closet is created for much-needed additional storage as well as further structural support for the loft space above. The bedroom itself is a brilliant combination of cozy and open. On the one hand, it is partially enclosed on all sides by half-height walls and uses one wall as a built-in headboard for the bed and a narrow walkway slot for bare-minimum accessibility. On the other hand, the main light and view access is left as open as possible – the partition on that side being composed of glass with metal fasteners made as small as possible for maximum connection of bedroom and living area. A small floor plan with high ceilings – typical of converted old buildings in big cities – may sound like less-than-ideal loft living, but it is the perfect place to create a space-specific lofted bed or bedroom design set like this one. There is an important interior design lesson ‘built in’ to this example, so to speak: multi-functional does not just mean transforming or convertible furniture, but can also apply to walls, ceilings, floors and other surfaces that serve more than one purpose in 2D plans or 3D space. 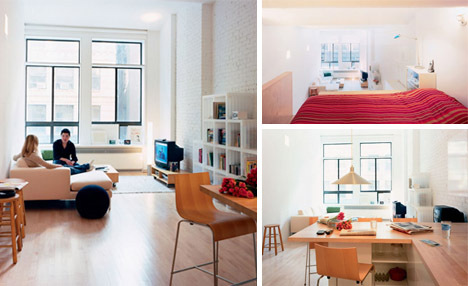 In short: a little space can go a long way, with just a few design choices converting a single-room studio to a split-level, multi-space apartment.